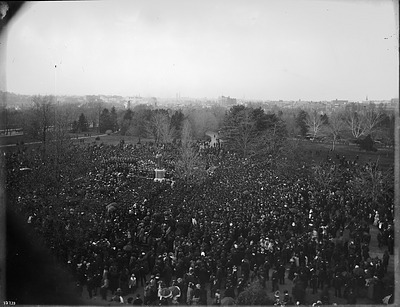 Statue of Joseph Henry Unveiled on the National Mall, April 19, 1883. Negative number MAH-10733, Smithsonian Institution Archives. Sure, you’ve heard of famed composer John Philip Sousa. But did you know that Sousa composed a march just for the Smithsonian? On November 6, 1854, the “March King” John Philip Sousa was born in Washington, D.C. With roots in Southeast Washington near the Marine Barracks, where his father played trombone in the United States Marine Band, it should have been of no surprise to anyone that he became a musical legend. Although he left the city for a brief period, Sousa returned to Washington in 1880, and at just twenty-five years old, he became the leader of the U.S. Marine Band. During his twelve years in that role, the group performed on its first concert tour and produced some of the earliest phonograph recordings ever made. In short, the Marine Band was a smash hit. But before he composed major successes, like “Semper Fidelis” in 1888 or “The Stars and Stripes Forever” in 1896, Sousa wrote “Transit of Venus” for Smithsonian’s unveiling of the Joseph Henry Statue in 1883. Joseph Henry, the Smithsonian’s first Secretary, died in 1878. Two years later, Congress approved an act to contract well-known sculptor William Wetmore Story to create the statue and allotted fifteen thousand dollars for the project. The Smithsonian then asked Sousa to compose a march for the occasion. On April 19, 1883, the Marine Band publicly performed “Transit of Venus” for the first time at the statue unveiling ceremony. Some think Sousa was inspired by Henry’s work to improve observations of the 1874 transit of Venus, the event when the planet passes between the Sun and a superior planet and can be seen from Earth. The band also played “The Hallelujah Chorus,” “The Heavens Are Telling,” and “Schiller” that day. Although the statue arrived in Washington in December 1882, the ceremony was scheduled for April, for the time coincided with the annual meeting of the National Academy of Sciences, of which Henry had been president at the time of his death. 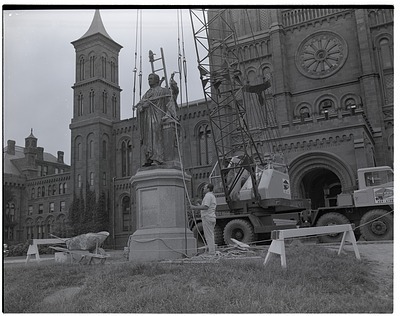 Although the statue initially faced the Smithsonian Institution Building, Secretary S. Dillon Ripley had the memorial turned to face other museums on the National Mall in 1965. But the Smithsonian’s connection to Sousa did not end with the statue dedication in 1883. His legacy is part of our collections. His silver-tipped baton has a home at the National Museum of American History and his portrait hangs in the National Portrait Gallery. Happy 164th Birthday to the great “March King."